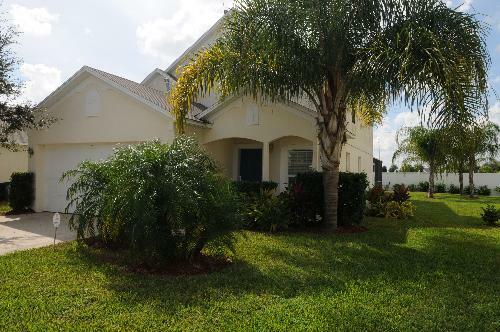 4 bedroom, 2.5 bathroom villa in the Santa Cruz community. Owned by Chris and Jane Bewlay. Ref: 636. For privacy reasons, the marker on the map shows the Santa Cruz community location and not actual villa location. There could be no better end to a fun packed day in the vacation capital of the world than to return to your very own luxury vacation home, stretch out by the private pool with a refreshing drink and relax in your luxurious surroundings. Dolphin Key Villa offers you this opportunity in a fabulously appointed holiday home for 8 guests with spacious rooms, massively oversized south facing private pool and spa, extended leisure deck with luxury pool furniture. This is a substantial villa on a large corner plot, fenced on all 3 sides, with no other properties backing onto it giving additional privacy and security. All you need to have a truly great holiday!!! 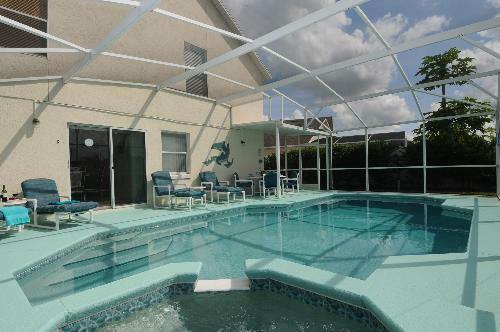 This outstanding four bed luxury, fully furnished villa with it's lush tropical garden is just minutes away from everything you want for a holiday in Florida. From Disney World and Universal Studios to Greg Normans Champions Gate golf course and the world renowned David Leadbetter Golf Acadamy there's so much for the whole family and everything is just so close. The lounge, with its vaulted ceiling and high windows is filled with natural light. It is wonderfully comfortable, just sink into the luxurious leather settees, relax and watch digital multi channel cable T.V. on a 40'Sony LCD TV or choose a DVD film to enjoy on the high definition blu-ray DVD player. The tiled floors throughout the main leisure areas maintain a cool atmosphere that makes a perfect break from the Florida sun. 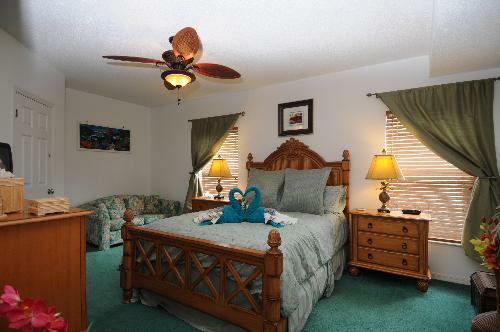 The elegant ceiling fan gently moves the air providing extra comfort. The dining experiences in the Orlando area cater for all meals and every taste as you will discover. However, should you choose to stay at home and create a meal there is a fully equipped kitchen waiting for you. With a large gas cooker, microwave, fridge/freezer with ice maker, blender and every utensil you could need, there is even a dishwasher and waste disposal to take care of the cleaning up. If you are having an informal meal you can use the kitchen nook where 4 people can sit with a further 2 people at the breakfast bar. If you would prefer to be more formal then the dining area has a table with settings for 6 but can comfortably be extended to accommodate 8 meaning that all your party can sit down together to enjoy a meal. 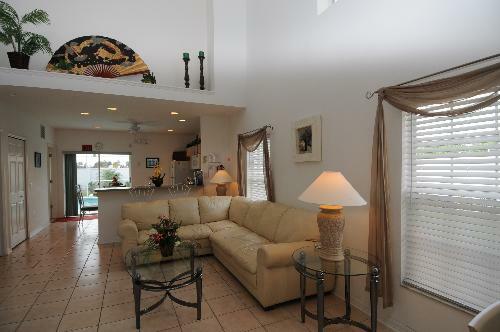 The tranquil Island Life master suite is on the ground floor. This is a spacious room beautifully furnished with a 'Tommy Bahama' suite boasting a sumptuous US Queen sized bed (equivalent to a UK King size) with luxurious bed linen, to help ensure you awake refreshed and rejunivated ready for the day ahead. 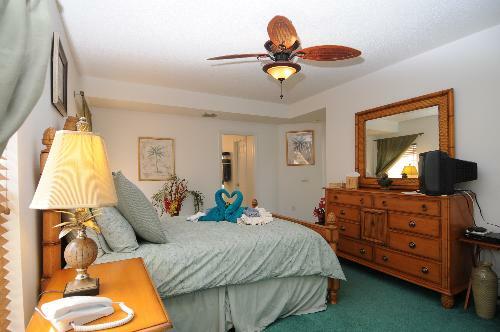 A ceiling mounted tropical palm fan wafts the air to ensure your comfort. Ample storage is provided by a large walk in wardrobe and chest of drawers. 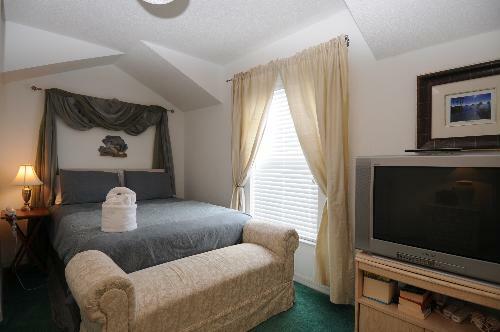 This room has a multi channel TV with remote and a DVD player, along with a clock/radio/alarm. For added security there is a safe in the master suite. The en-suite bathroom has his and hers vanity basins with large vanity mirror. There is a large walk-in shower, and separate bath. A hairdryer is supplied. The large peaceful upstairs Ocean master has a double Montgomery pillow top bed with luxurious bed linen, large fitted wardrobe, a chest of drawer. A remote control fan and light lets you adjust the settings from the comfort of your bed. A multi-channel TV with remote and a Wii games consul with duel remotes are provided for your enjoyment. There is direct access to the Jack and Jill bathroom, which has a single vanity, full sized bath and over the bath shower. A hairdryer is also supplied. The two twin bedrooms each have two singe Montgomery pillow top beds with luxurious bed linen. 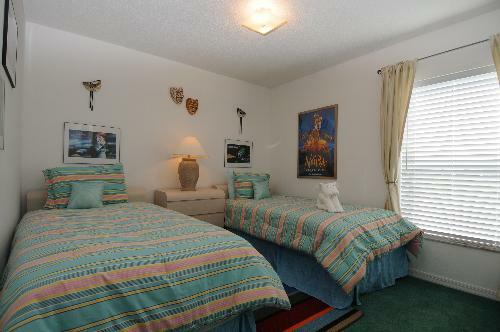 There are remote control ceiling fans and lights which can be adjusted from the beds. 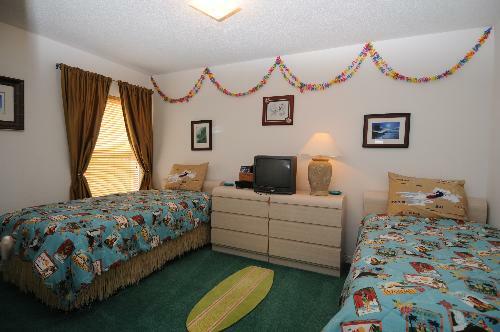 Both rooms are equipped with a TV and DVD player. 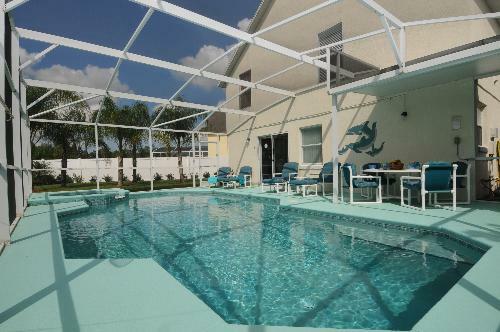 The villa is offers unlimited high speed, 8mb, wireless internet access. Bring along your laptop or tablet, stay in touch with family and friends or surf the internet to help plan your days, reserve tickets, book trips from inside the villa or whilst sunbathing on the pool deck. But the main feature of this luxury villa is its beautiful extra large south facing Summerwind pool and spa with waterfall effect. It has extra decking and luxury Palm Casual pool furniture creating a fantastic place to relax at the end of a day sightseeing or even all day when the mood takes you. 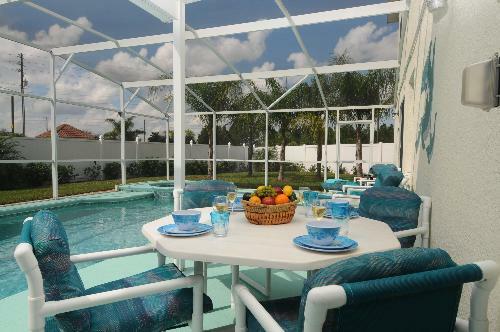 With the lanai area offering shade throughout the day the pool area is perfect for soaking up the Florida sun. 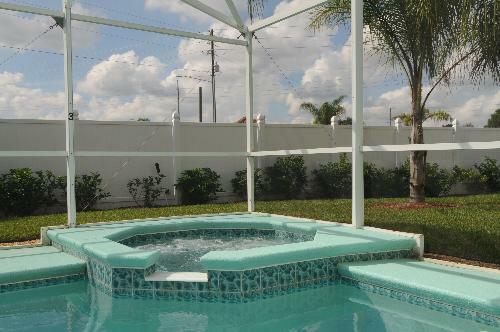 The pool and deck are enclosed by mesh screens which lets in the sun while keeping out all unwanted insects. This is the perfect place to end your day, relaxing in the spa watching the top of the range l.e.d. lights change the colour of the pool. 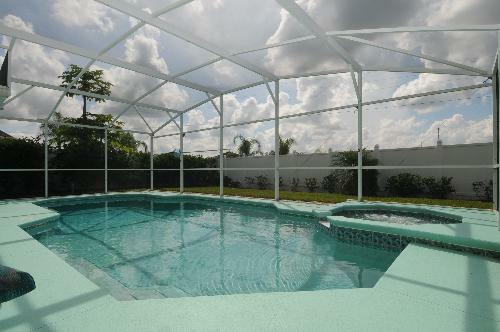 The pool area is fenced on all three sides to ensure your total privacy. 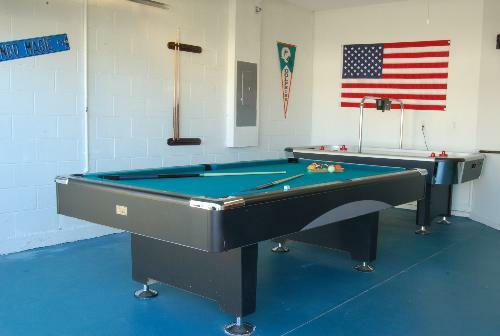 The villa also boasts a fabulous games room, which will provide hours of fun and relaxation for the whole family. A top of the range full size professional 8’ slate bed pool table covered in green felt, with full profile rubber cushions is provided along with a range of cue sizes, which should be OK for most people in your party. There is also 7’ air hockey table with it’s white hi-gloss playing surface and it’s deluxe electronic score board and timer, which cheers when a goal is scored, has proved to be very popular with everyone from 4 years upwards. 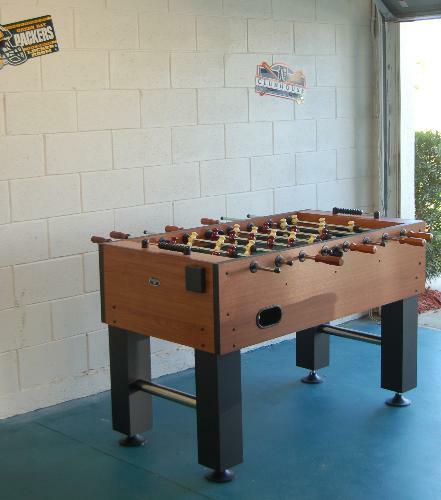 When the 54” table football (foosball table) with it’s green pitch is added the result is one of the most comprehensive games rooms available and ensures that on the days you just want to relax at the villa there are enough options to keep everyone happy. This villa has all the extra luxuries you would expect in an American home. 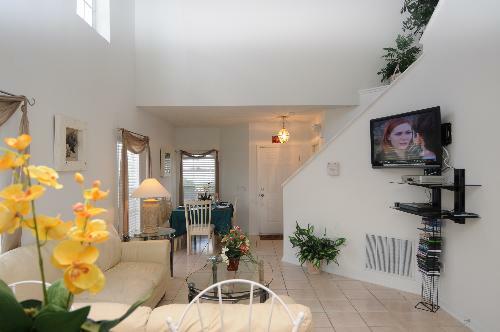 Air conditioning, digital cable TV/DVD, full kitchen, automatic washer, dryer, TVs and DVD players in all bedrooms, telephone, private filtered swimming pool, spa pool with mesh insect screen and plenty of pool furniture. While towels and linen are provided we are afraid that no pets are allowed and this is a strictly no smoking property. There are NO HIDDEN EXTRAS!! Refundable security deposit .................................... $400/£250 payable with balance. Cleaning fee for stays of less than 7 days ............ $100/£60. We aim to make the whole process as easy as possible, and accept payment in US$ or £ sterling. Payment can be made by credit card, money order, personal cheque, traveller’s cheque or wire transfers. Credit card payments can be made from any country, but will be charged in US$ and carry a surcharge of 3.0%. Reservations and Prices are guaranteed on receipt of a completed booking form and deposit. There is no minimum rental period and arrival and departure are available on any day of the week. 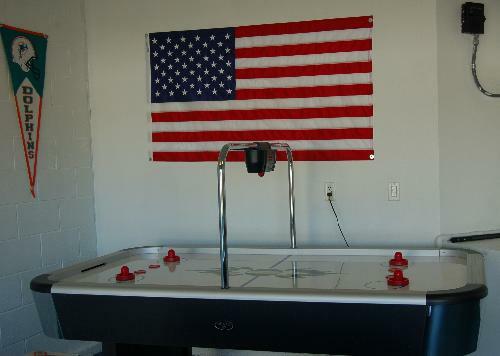 Hawaiian Room Cirque Room 8 Slate Bed Pool Table Anyone for Air Hockey? How about a Game? Your enquiry will be sent to villa ref 636 only. This page has been viewed 46903 times since 06 Mar 2003.